If you look up the word “Opa” on the internet’s urban dictionary, the first definition that appears is, “A word that Greek people use for no apparent reason at all.” This tongue-in-cheek definition has some truth to it, but hardly does the term justice. A much better explanation: “A Greek word used to describe a jubilant emotion of/during ‘celebration’.” Kind of a cross between “yahoo!” and “cheers,” and always punctuated with an exclamation mark. Knowing this, one might expect a visit to a restaurant named Opa! Greek Taverna (exclamation mark included) to be special, and one would be right. Upon entering and being greeted by owner Kostas Lazanas, one of the first things you notice is the welcoming smile. We have rarely seen Kostas without it, and it is complementary to the atmosphere and beautiful Mediterranean decor inside. As Kostas led us to our table, we couldn’t help but feel a celebration was about to begin. We perused the menu while sipping one of the signature cocktails , the Skinos Sour. Distilled from the sap of the Mastiha tree, this spirit with hints of juniper berry and mint was a refreshing start to the meal. 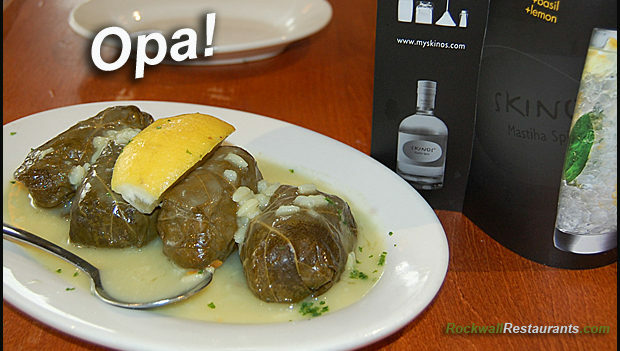 For our appetizer we chose Dolmades, grape leaves stuffed with a blend of fresh herbs, spices, ground beef, and rice, smothered in a creamy lemon sauce. With this mix of flavors, we would have been happy to order a little more and call it a meal. It was delicious and satisfying. However, we saved room for the house special we had heard so much about. The Lamb Shank Yuvetsi is brushed with fresh rosemary, garlic and onion, braised in a light Greek tomato sauce, then oven baked until the meat falls off the bone. We were told by friends that this was one dish not to be missed. They were right, and we were right to save room. We also ordered the Grilled Lamb Chops rubbed with Mediterranean sea salt, cracked peppercorn and Greek oregano. The chops were tender and tasty, and paired perfectly with the sides. Both entrees came with a generous helping of rice and a savory mix of vegetables. We were left with just enough room for dessert. The generous portion of Baklava Cheesecake made it easy to share. With double layers of cheesecake and paper thin baklava pastry drizzled with honey and topped with spiced, crushed walnuts, we felt like we were committing a sin with every bite. Every meal is a celebration. Opa! Indeed, a visit to Opa! does leave you feeling jubilant. Attention to detail in the service, the food and the ambiance makes it obvious that Kostas not only knows what he’s doing, but takes great pride in execution. And that makes us smile too. Opa!